Being sent home from school for bad behavior is common, but not having a proper hair cut? That is exactly what happened to 5-year-old, Ethan Clos when he was send back from his Kindergarten because of a stylish spiked haircut! While on Spring Break Ethan had gotten a mohawk style where the head is shaved on the sides and only a strip of hair is left on top and down the middle of the scalp. He also got a lot of attention from his classmates for his new hairdo according to his mom. “They seen his hair like it was. All the little kids were going over and feeling on it and everything,” Ethan’s mom, Keshia Castle said. Clark Shawnee School District officials however were not too pleased with the idea. They said that the new cut was getting too much attention and the students were distracted making it difficult for the teachers. “Our policy clearly states that any dress or grooming which is disruptive or distracting to the educational process is not acceptable. In this particular case, the student’s hairstyle did provide disruption to the classroom,” said Superintendent Greg Morris. Keshia was informed by her son’s school, Reid Elementary school, to not send him back until his hair had been fixed. Little Ethan’s suspension comes at a time when another Tim Seelig, a volunteer Shawnee High School football coach, was lauded and profiled in the Springfield News-Sun for sporting a blond Mohawk in 2011 and 2009 to motivate the team. When asked why the different approach to the two similar haircuts, Morris says, the two situations don’t compare. “One involved an extracurricular spirit initiative designed to motivate our kids in the football playoffs a year ago. Classrooms were not disrupted. The other poses a disruption to the learning environment as well as violates the student dress code,” Morris said. Ethan’s grandmother Joyce Wells however has a different opinion. She says that the haircut Ethan has is very similar to another one known as the fade, a haircut in which the hair is cut down to the scalp or close to it on the sides and back of the head and hair is left on top. “You understand there’s a dress code and everything but you think this is perfectly acceptable? Right. I do, because if you look at the Mohawk and if you look at the fade, there’s not much difference except he’s bald on the sides,” she explains. 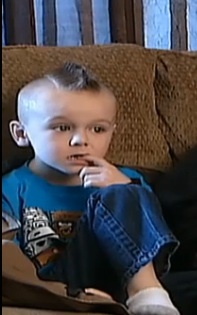 The kindergartener did not attend school on Friday but will re-join from Monday after his controversial haircut is toned down.